We’d recommend a visit to the tower and there’s even an elevator if you don’t fancy the stairs. You will be blown away by the view of the Old Town Square from the top – it really is fantastic and for us, this square was our highlight in Prague. The Astronomical Clock outside has an endless stream of tourists lining up for photos in front of it. The positions of the sun and moon are depicted along with the calendar dial and it also has moving sculptures. On the hour, every hour you will witness the procession of the twelve Apostles. The clock’s official name is the Orloj and it is composed of three main parts. 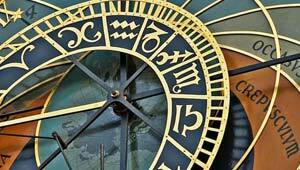 First, the astronomical dial which represents the position of the Sun and Moon in the sky and also displays various astronomical details. Then, there is the ”The Walk of the Apostles” mentioned above, which occurs on the hour. Finally, the lower dial is a calendar face with medallions representing the months. The oldest part of the clock is though to date back to the early 1400s. Seeing the clock will not take a long time, no more than 5 or 10 minutes really, but it is worth watching it on the hour if you can. There really can be a large number of people in front of it at busy times though. The Tourist Information Office is open daily from 9am to 7pm, the Old Town Hall Tower is open on Mondays from 11am until 10pm and Tuesdays to Sundays from 9am to 10pm. Adult admission to the tower is 105 CZK with children and students at 55 CZK (2012 prices). The Old Town Hall is featured in the Prague In One Day Sightseeing Tour. The nearest Metro stop is Staromestska (Line A).